Log Horizon 2 is a sequel to Log Horizon. It will obviously have Spoilers and I’m covering it because I liked Season 1. If you want me to tell you what I think of it then I just did. I’m gonna go talk about it with Spoilers below the jump now. Last Time on Log Horizon, our characters had to deal with people a group of NPCs infiltrating a festival they were running in order to make things a mess, but they countered it with cute girls. Then Shiroe met with Nureha from Plant Hwyaden who were ruling the town of Minami. Also, like 24 episodes before that. It would be a full article to explain everything that would happen so I’m just gonna jump in to this. I might do that recap when I have more time but this is already a week late. The episode starts with a cold open showing a lot of things happening in what’s probably the near future, but the most important one to me is the one that most people might not recognize. One of the groups is a bit tied to the Meta-Plot that wasn’t really touched in the first series. This excites me, but as the rest of it was flash-forwarding I’ll let it happen later. After the opening we cut back to Akihabara where they are finishing up a fall festival, but things aren’t doing so well money-wise. It took a LOT of gold to buy the buildings the Council has now and it takes even more to keep a hold of them. We’re not talking “raise the tax on the storage system” high. Shiroe has a plan to try and get the gold, but he has to leave town for it. Naotsugu follows him and they pick up Regan, and together they meet with Kinjo of the Kunie clan, who run the money storage system. Shiroe needs 80 TRILLION gold to solve their problems and he wanted to at least try the diplomatic approach with the Kunie clan before trying to get it the less-than-nice way. Finding and fighting the being that supposedly gives money to resurrected monsters. Kinjo says he won’t help them, but he leaves a hint about how to reach their goal. Shiroe knows they’ll need help with the fight, but he wants to avoid getting that help form Akihabara since it’s under observation from Plant Hwyaden and he wants it to be a secret. Before the end credits it cuts to another Flash Forward. Shiroe and Akatsuki meet on what looks like the moon. It seems like they both died and this is what happens, at least before respawning. Next time, it’s off to Susukino to meet the best named character in the series, William Massachusetts, and Demikas, the monk that used to rule the town with an iron fist. It seems like Shiroe’s help is coming from the least likely of places. 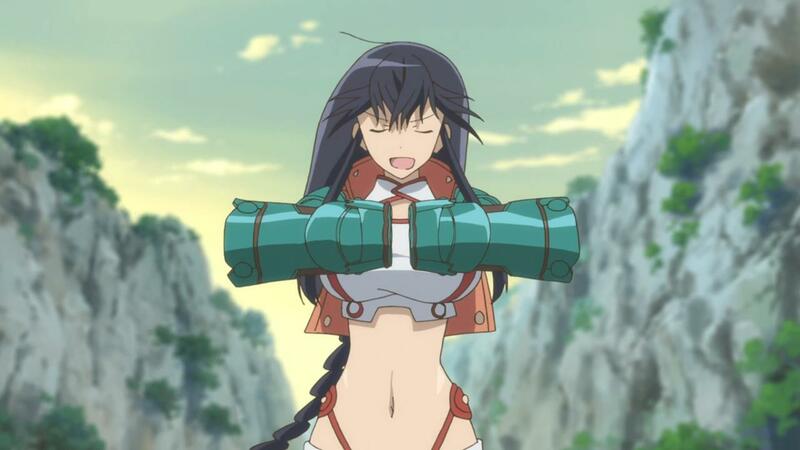 This entry was posted in Log Horizon 2: Database Boogaloo, Uncategorized and tagged Akatsuki, Database, Database Database, Database Database Just Living in the Database, Debauchery Tea Party, Elder Tale, Isuzu, Kanami, Krusty, Leonardo, Log Horizon, Minori, MMO, Naotsugu, Nyata, Rrrrrrrrrrrrrrrrundlehouse Code, Rudy, Rundelhouse Code, Shiroe, Tohya.